Sep 17 By Jen 2 Comments This post may contain affiliate links. 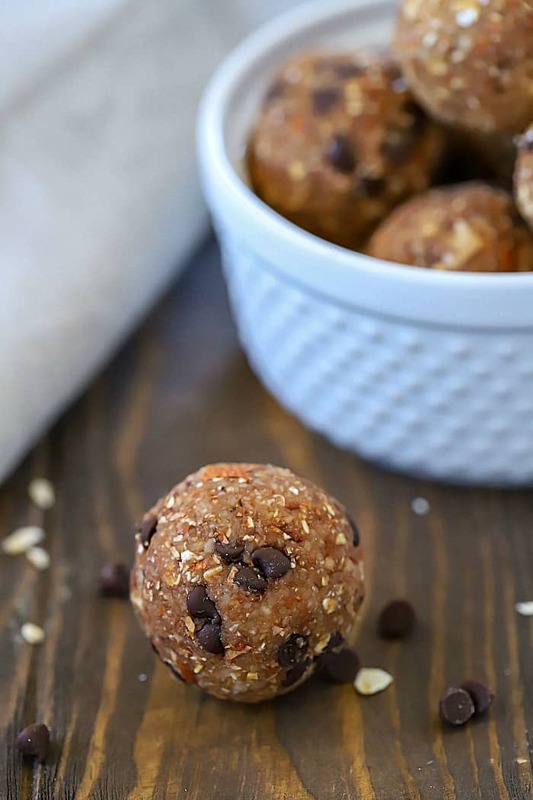 Looking for a easy to grab snack that’s packed with flavor AND protein? 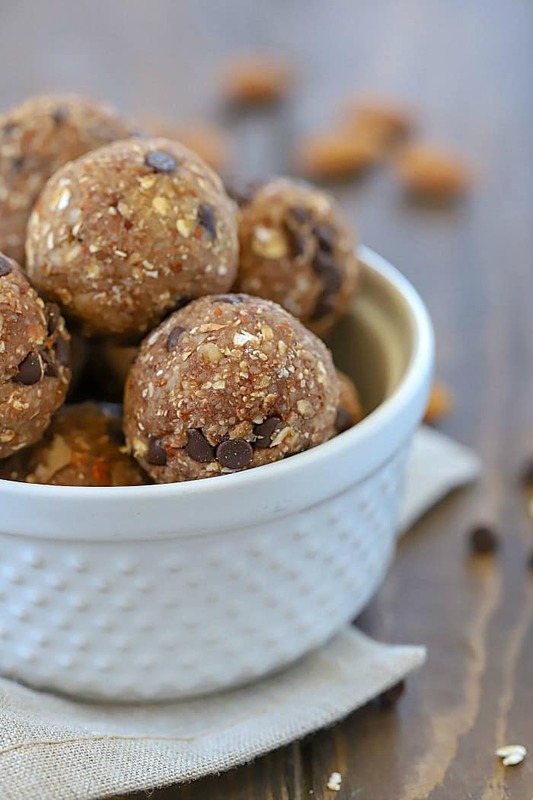 Try these Chocolate Almond Protein Energy Bites! 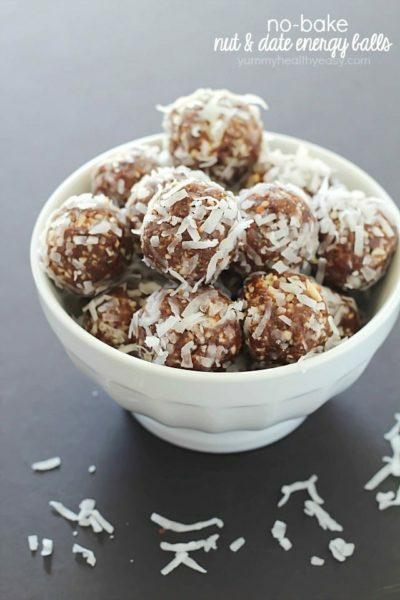 There are 5 grams of protein in each ball! 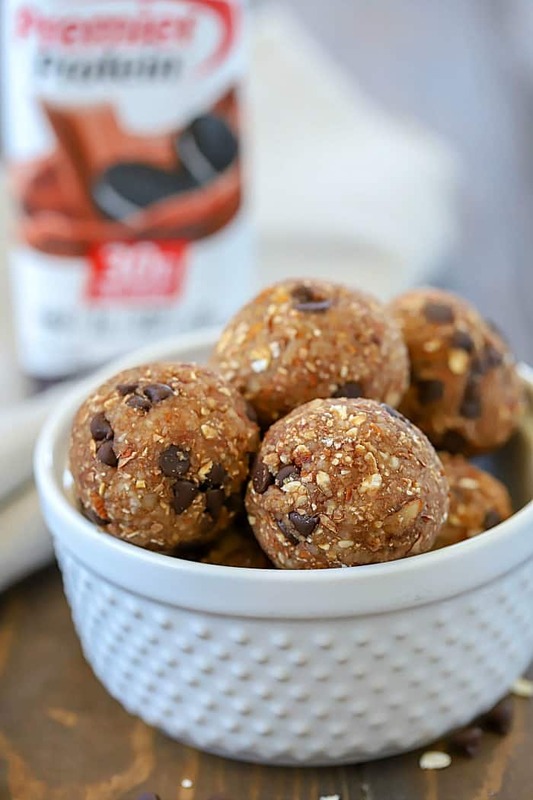 These Chocolate Almond Protein Energy Bites are tasty little protein bites that are perfect to grab on the go! 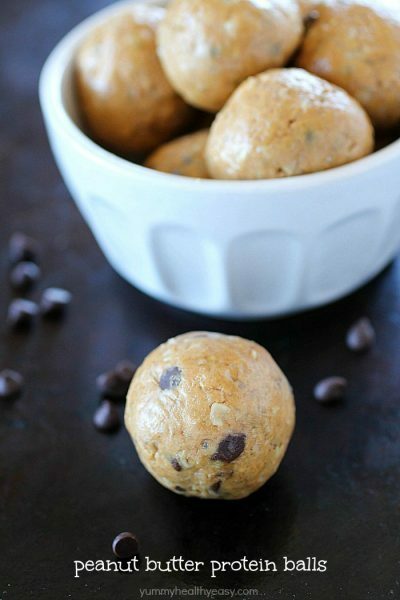 They’re SO yummy and have 5 grams of protein in each ball! I’m honestly the worst when it comes to finding healthy snacks. I’m great at making and eating healthy meals but when it comes to what to snack on, I tear the pantry apart looking for something healthy and end up not eating anything because it’s all crackers and cereal, lol! 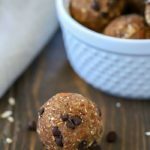 When Premier Protein asked me to come up with a healthy snack recipe, I immediately thought of making protein energy bites. 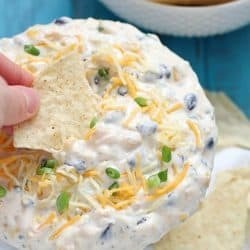 I love that you can make this snack ahead of time and keep them in your refrigerator to grab anytime you feel that snacking urge. Word of caution, they’re kind of addicting, I’m not going to lie! They’re seriously so friggin delish. 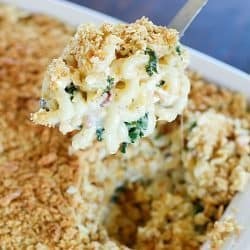 There’s a fabulous texture that the almonds and oats give to these energy bites. I made them using the Premier Protein Cookies & Cream Shake flavor, which is one of my favorites. But feel free to use the vanilla or chocolate shake flavors if you want, though! I decided for these energy bites that I wanted to soak the almonds in the protein shake overnight to give them almonds more chocolate flavor and make them nice and soft for the blender. In the morning, I used a straining spoon and drained them and then blended them up with some of the leftover shake that they had been soaking in. Once the almonds were blended into small pieces, I added oats, cocoa, honey, vanilla extract and more of the reserved Cookies & Cream Protein Shake and blended it up. Then I stirred in some mini chocolate chips and rolled them into balls aka protein energy bites. 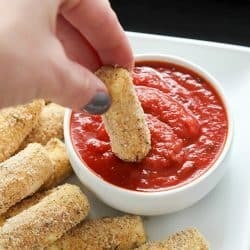 Super quick and easy and you have snacks on hand for any time of the day when hunger strikes! 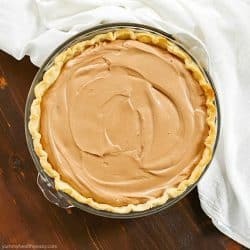 Please do yourself a favor and make these this week! You won’t regret it, promise! 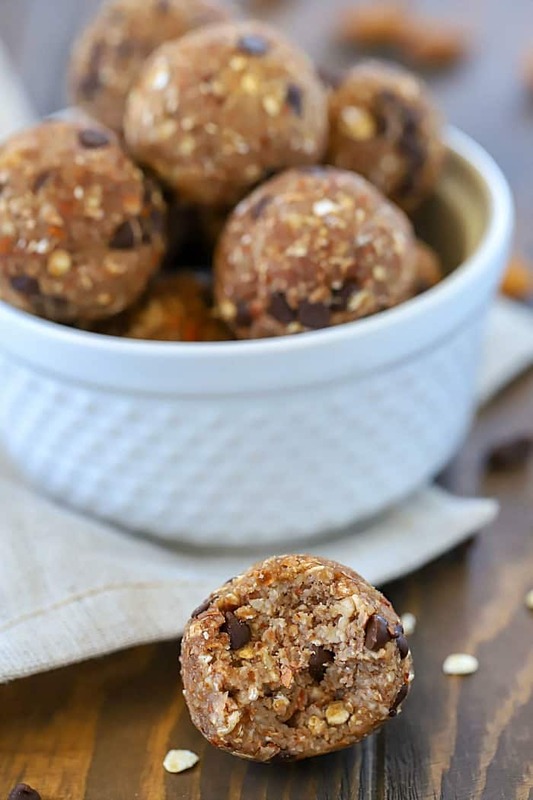 These Chocolate Almond Protein Energy Balls are tasty little protein bites that are perfect to grab on the go! 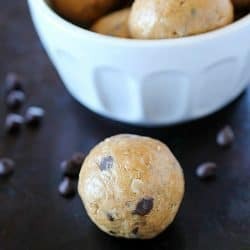 They're SO yummy and have 5 grams of protein in each ball! Pour almonds into a bowl. Cover with Cookies & Cream Protein Shake and let soak several hours or overnight. Using a straining spoon, take almonds out of the bowl, straining them from the protein shake and place into a good blender. Add 3 Tbsp. of protein shake used to soak the almonds into the blender with the almonds and pulse until almonds are mostly ground up. Add in the oats, cocoa, vanilla, honey or agave (or other favorite sweetener) and 3 more Tbsp. of protein shake used to soak the almonds into the blender and blend together. Add in additional protein shake one tablespoon at a time if needed, but mixture should be thick. When mixture is combined and mostly blended, scoop out into a bowl and fold in chocolate chips. 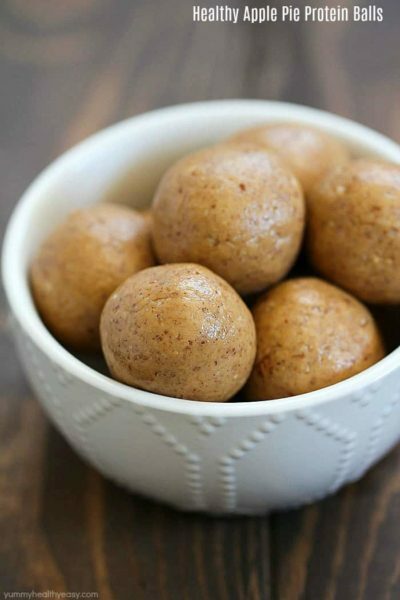 Roll into energy balls and store in the refrigerator in an airtight container. Enjoy! « Sausage Cucumber Bites – a Low Carb Snack! Hi Debra! 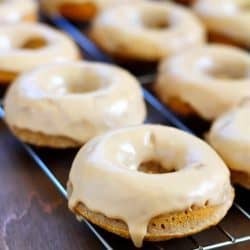 I’ve only made these using almonds but I’m sure cashews will work too! I actually have some cashews…maybe I’ll try it out and see how they turn out! I’m obsessed with these little energy bites!